Exhibit talk: "From Litchfield to Yale: Law Schools in Connecticut, 1782-1843"
Connecticut gave birth to the earliest American law schools, one of which lives on today as the Yale Law School. A March 27 talk at the Yale Law School will delve into the school’s origins. 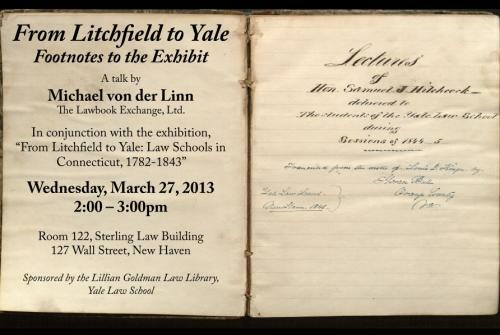 The talk, entitled “From Litchfield to Yale: Footnotes to the Exhibit,” takes place at 2pm on Wednesday, March 27, in Room 122 of the Sterling Law Building (127 Wall Street) on the Yale University campus. The talk is free and open to the public. The exhibition is open to the public, 9am-10pm daily through May 31, in the Rare Book Exhibition Gallery of the Lillian Goldman Law Library. It was curated by Michael von der Linn and Mike Widener, the Law Library’s Rare Book Librarian. It can also be viewed online here in the Yale Law Library Rare Books Blog. The Legal History and Rare Books Special Interest Section (LHRB-SIS) of the American Association of Law Libraries, in cooperation with Cengage Learning, announces the Fourth annual Morris L. Cohen Student Essay Competition. The competition is named in honor of Morris L. Cohen, late Professor Emeritus of Law at Yale Law School. Professor Cohen was a leading scholar in the fields of legal research, rare books, and historical bibliography. The purpose of the competition is to encourage scholarship in the areas of legal history, rare law books, and legal archives, and to acquaint students with the American Association of Law Libraries (AALL) and law librarianship. Eligibility: Students currently enrolled in accredited graduate programs in library science, law, history, or related fields are eligible to enter the competition. Both full- and part-time students are eligible. Membership in AALL is not required. Requirements: Essays may be on any topic related to legal history, rare law books, or legal archives. The entry form and instructions are available at the LH&RB website: http://www.aallnet.org/sis/lhrb/. Entries must be submitted by 11:59 p.m., April 1, 2013. Awards: The winner will receive a $500.00 prize from Cengage Learning and up to $1,000 for expenses associated with attendance at the AALL Annual Meeting. The runner-up will have the opportunity to publish the second-place essay in LH&RB’s online scholarly journal Unbound: An Annual Review of Legal History and Rare Books. Please direct questions to Robert Mead at or Maguerite Most at .